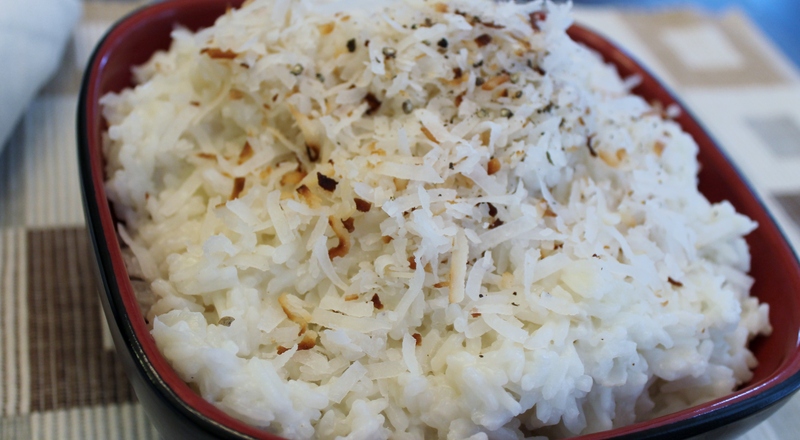 I blogged about this coconut rice a while back but as with many of my earlier post this one needed some updated photos, plus it deserves a spot all on its own. To view the original post you can go here. I have made this so many times and I have since made some modifications from the original recipe. This sweet, sticky rice is unbelievably delicious. If you like the taste of coconut then you will love this side dish. 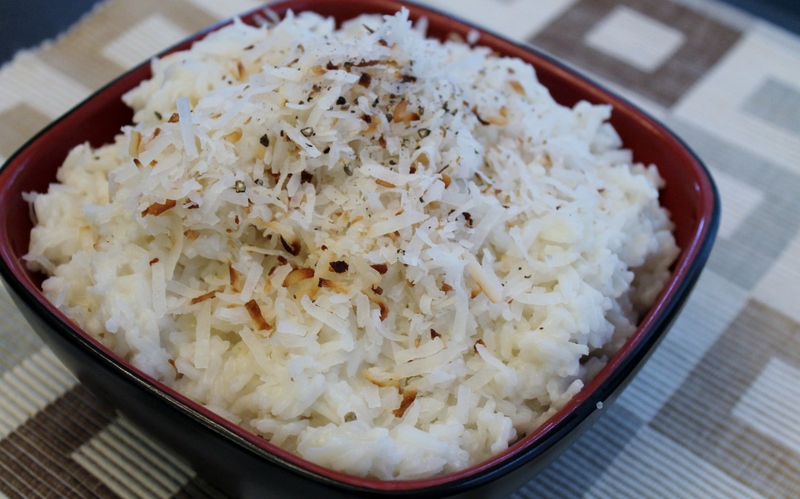 It uses coconut milk and is garnished with toasted dried coconut for exquisite flavor and unexpected texture. I like the simplicity of the tropical and nutty flavor that the coconut alone adds to the rice, but you could add other flavors such as cilantro, lime juice, mango or pineapple as well. This rice has become a mandatory addition to our luau night at the beach with my family. I love to serve this with seafood but it’s also a great accompaniment to curries, and stir-fried dishes. – Melt butter in a large saucepan over medium-high heat. Add the diced onion and begin to cook, 3-5 minutes. – Add rice, milk, and water to the pan. Stir occasionally to keep rice from sticking to the bottom of the pot and burning. Once the coconut-water has begun to gently bubble, stop stirring and reduce heat to low. Cover tightly with a lid and let simmer 15-20 minutes, or until most of the liquid has been absorbed by the rice. – Replace the lid and turn off the heat, but leave the covered pot on the burner to steam another 5-10 minutes, or until you’re ready to eat. – Toast the coconut by placing the coconut flakes in a frying pan over medium-high heat and stir until light golden brown. 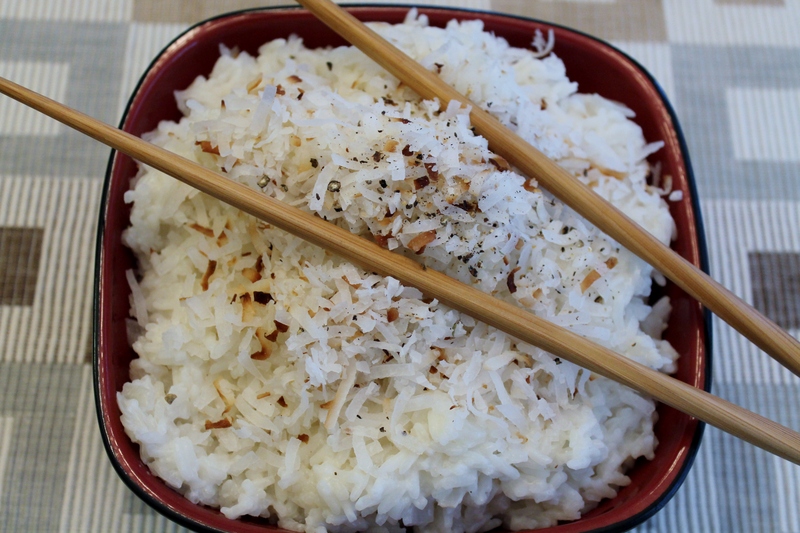 – When ready to serve, remove the lid and fluff rice with a fork or chopsticks. Add salt and pepper. Taste-test the rice, adding a little more if needed. – Top with the toasted coconut.